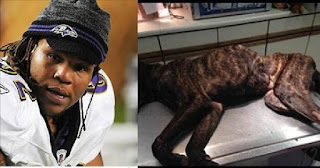 Home » »Unlabelled » NFL Player Starves His Pet Dog Until It Dies! Ban Terrence Cody From The League! NFL Player Starves His Pet Dog Until It Dies! Ban Terrence Cody From The League! LATEST UPDATE: The ex-NFL player who starved his dog to death has been released from a Baltimore jail 3 months early … TMZ Sports has learned. Terrence Cody — who last played for the Baltimore Ravens — was sentenced to 9 months behind bars after pleading guilty to multiple animal cruelty charges back in March. Prosecutors said the 28-year-old didn’t feed his Canary mastiff for up to ten weeks. They also said the dog was kept in a crate that was never cleaned. According to a rep for the jail, Cody was released on September 21st. He was given 88 days credit for working and good behavior. UPDATE: Terence Cody has been found guilty of misdemeanor charges in connection to the neglect of his pet dog, Taz. He is facing up to three years behind bars at his sentencing in January 2016.